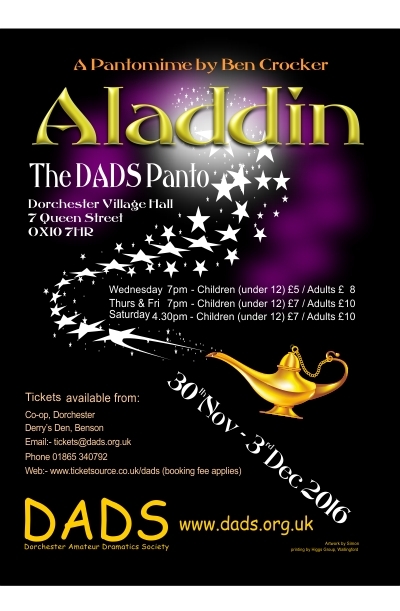 ‘Aladdin’ the DADS (Dorchester Amateur Dramatic Society) Panto for 2016 was another triumph for the company now in its 33rd year. The performance was all the more remarkable in being the directorial debut of Ann Winslet. She was ably assisted in this by Rosemary Mills. Winslet and Mills should do it again. They look like a winning team. The denizens of Dorchester are always up for a good laugh – especially on a chilly winter evening in early December. And there were laughs aplenty in this production which turned Ben Crocker’s version of this very traditional panto into an effervescent and refreshing show. Ann Winslet skilfully blended a cast of highly experienced players with some relative newcomers and a sprinkling of complete novices. The result was a show rattling along breathlessly with hardly any hitches. 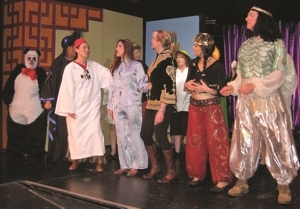 Particular mention should be made of the costumes by Elaine Moore and her team of helpers. These were outstanding. This reviewer was so much taken with the heliotrope hairdo of Widow Twanky (Mike Lord) he suggested to his wife she should try a purple dye. (The idea received short shrift) Also much admired were the matching chessboard socks and emergency light helmets of Sergeant Ping (Mark Williams) and PC Pong (Carol–Ann Tilley). Thames Valley Police should adopt these as their standard uniform as soon as possible. The stripey socks and sandals combination of Mike Selway in the opening number by a well coordinated chorus were also a big hit. Musical direction by the ever-reliable Russell Leigh with support from Grace Hancock gave us a compilation of appropriate popular songs delivered with gusto by a well-trained cast. It left the audience wanting more music. The Abba hit ‘I Have a Dream’ duet by Aladdin (Jo Cleary) and Princess Jasmine (Amanda Taylor) was particularly well received. The show rattled along breathlessly. The colourful and neat set design by Adrian Brooks and his team was up to the usual high standard expected of a DADs production. The torture bench constructed for Aladdin by the evil Abanazar (John Cornelius) was worthy of the climax to a Bond movie. But the reviewer did have trouble recognising the entrance to Aladdin’s cave – it looked a bit like a large dead hedgehog or possibly a possum playing possum. 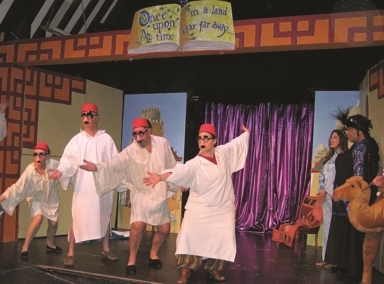 As to the cast it was clear they had worked very hard to deliver such consistent performances keeping the audience constantly entertained. For many the highlight would have been the hilarious Egyptian dance towards the end of the show. This had obviously been an intensively rehearsed team effort. Of the individual performances John Cornelius as the evil Abanazar proved suitably greasy and sinister despite the Brummy accent and occasional attempts to imitate Tommy Cooper. The two genies Maxine Briscoe and Rosemary Mills made a nice contrast in displaying their magic while the constabulary in the form of Sergeant Ping and PC Pong performed their slapstick routines with great style. 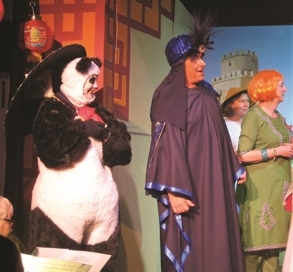 Ed Metcalfe remained dignified yet frightening throughout his performance as the emperor while Rachel Winslet- Morris (Wishee Washee) and Jane Brooks (Nobby) both gave strong support to Mike Lord whose performance as Widow Twankey was outstanding. It was also hard not to be captivated by the charms of Amanda Taylor whose performance as Princess Jasmine was difficult to fault. 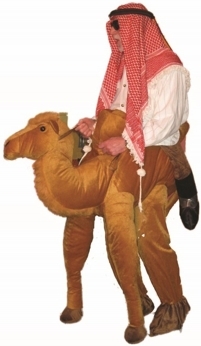 Gerry Wells (no previous experience as an actor) left his beloved lawnmower to join DADs on stage and nearly stole the show with his performance as a camel. He knew his lines perfectly and never missed a cue! Finally the title role: Jo Cleary returned to the stage for first time since childhood to take on the demanding role of Aladdin. She offered her performance as a tribute to her late father, Terry Chipperfield, who had for many years been a leading light at DADS and one of its founders. She slapped her thigh in the finest traditions of the Pantomine Principle Boy and played throughout with consistency and vigour. Terry would have been proud of her as he would of the whole company.